2018 for me, seems to be the year of skincare. I finally know what works for my skin and what doesn't. Instead of using things all over, I focus things on one area to see how my skin reacts and then proceed to the full face. Korean skincare has been my obsession as of lately, I have tried a few products and they have all worked wonders. 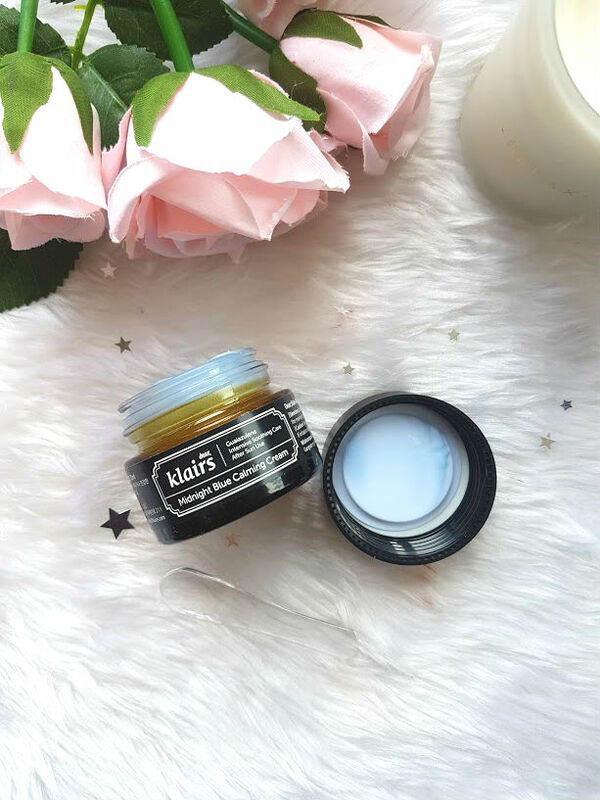 This incredible looking cream from Klairs is just one of them. 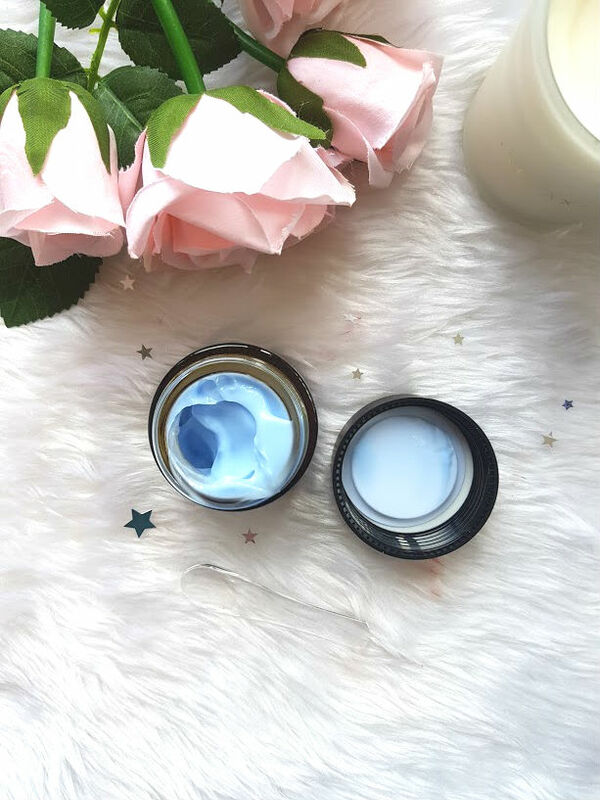 What is the Klairs Midnight Blue Calming Cream? Well, I asked myself this exact same question when it arrived on my doorstep. It is infact a cream that calms and soothes the skin as well as helps with moisturising if you have super dry skin. 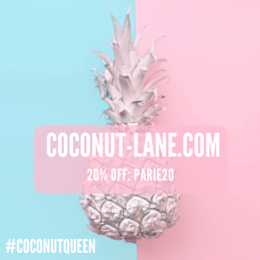 As a very thick and creamy cream, it calms the skin right down as well as helps strenghten senstive skin. 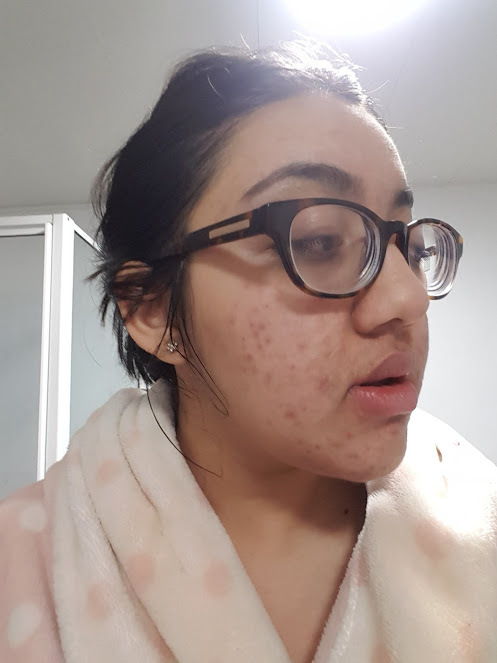 My skin is very sensitive and irritate, the tiniest amount of something in a product that it doesn't like, causes my skin to erupt and before you know it, my skin looks a mess. The main ingredient in this chamomile extract, you know the thing you put on chickenpox? It is a very effective calming ingredient that helps calm inflammation and regenerates skin cells. This is also why it is blue - such a pretty colour and makes you look like an alien! I have been applying this a night, and would say that this is the best time to apply only because of how blue and thick it is. It comes with a mini spatula to help apply it to the areas of concern and trust me when I say, you only need a little bit every night as this goes a long way. I've been testing this in such a way to find the best way for me, this is not a spot treatment but it is very effective at helping calm post 'spot popping', and any acne scars that you might have that are very red. I have been using a small of this every night for the past three weeks to only one side of my face and my trusty aloe vera gel on the other. I love aloe vera gel as it cools and calms my skin too but the difference between using these on two sides of my face is incredible. Please excuse the state of me but I wanted to capture my skin at its peak, which is the morning after applying everything. These photos are taken on the same day at the same time, just the other day in fact post using the calming cream and aloe vera. 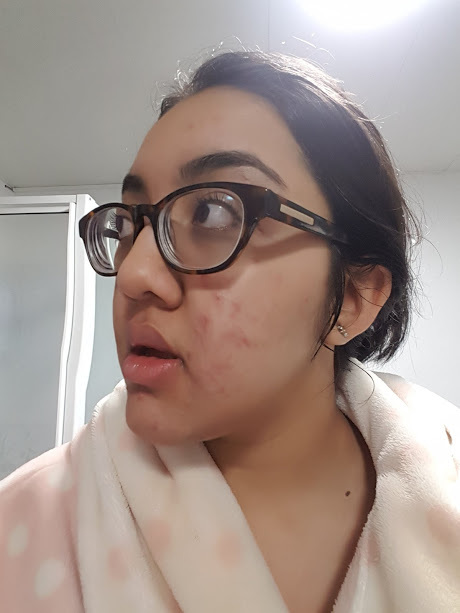 The picture above is the side that I have used aloe vera gel on every night, as you can see my skin is still heavily covered in acne scars, they are red and quite potent. The other side, which is below used to look like the side shown above but it is so much more clearer. I honestly can't believe it, the redness isn't as visible and the scars are so much more calm and not visible. I don't think that is all down to this cream, but it has something to do with it for sure. I now need to see these same effects on the side, so hopefully in no time my skin will be looking so much more calmer and clearer.